The following article was written by a friend and colleague of mine, Sheldon McFarland, from Loring Ward. 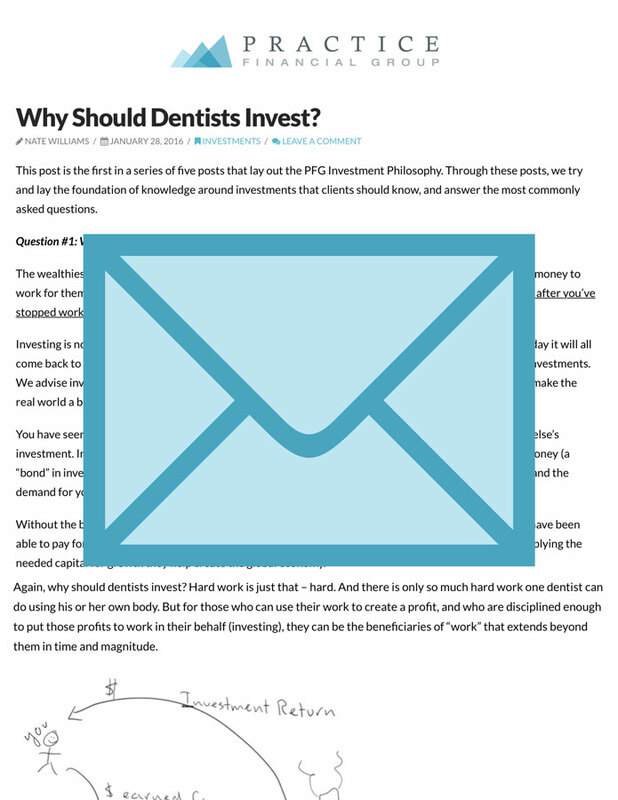 I thought the article was well-written and useful on a very important topic – to help us maintain a long-term investment perspective. I hope you too find the information relevant. Nearly 200 years ago, the American short story “Rip Van Winkle” became an instant classic. The main character, Rip, is a simpleminded soul who lives in a village by the Catskill Mountains. He is an unambitious man who is very good at avoiding two things: work and his wife. One day, while doing what he does best, he wanders into the mountains to go hunting, meets and drinks with a strangely dressed crew, and falls into a deep sleep after drinking their liquor. He awakens and is surprised to find that his dog is gone, his rifle has rusted, and he now has a long beard. Rip makes his way back to his village only to discover that everything has changed. His wife has died, his friends are gone, and the portrait of King George III in the tavern has been replaced by a portrait of someone he does not recognize — General George Washington. Rip Van Winkle had been sleeping for 20 years! And in the process, he missed one of the most exciting periods in the history of this country — he slept through the American Revolution. Well, what if Rip slept through the worst 20-year period in stock market history? 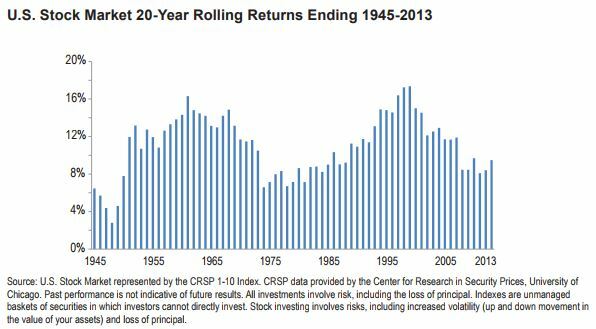 The chart below shows the overlapping returns — often referred to as rolling returns — for all of the 20-year periods between 1926 and 2013.
the value of your assets) and loss of principal. If Rip had fallen asleep during the worst 20-year period for the U.S. stock market, the 20-year period from 1926 to 1948, he would have slept through the stock market crash of 1929, the Great Depression and all of World War II, which included the fall of France to the Nazis, Pearl Harbor and D Day. These are the events that kill capitalism and market growth, right? Yet, it is a 20-year period that rewarded investors in the U.S. stock market with a return of almost 3% per year. To put that into perspective, $100,000 compounded at 3% per year for 20 years is $180,6113 almost double the original investment. Not bad despite all that happened during that period. What if I told you Rip fell asleep during a period that would experience the Cold War, Black Monday, savings and loan bailouts, the Persian Gulf War, the Mexican peso collapse, the Asian currency crisis, the Russian financial crisis, and the failure of Long-Term Capital Management — one of the largest hedge fund collapses in history? What would you guess Rip earned investing in the U.S. stock market during that 20-year period? He must have lost money! How could he not? Headlines can be deceiving. The market would have rewarded him with just over 17% per year for 20 years. To put that into perspective, $100,000 compounded at 17% per year for 20 years is $2,310,560.4 This period — 1980 to 1999 — happens to be the best 20-year period since 1926 by the way. I bet you wouldn’t have guessed that given the events mentioned. What am I getting at with this analogy? We worry that many investors view their stock market investments the wrong way. We believe you should view your investment portfolio the same way you view your house. Think about the value of your house and its price fluctuation over time. The price is certainly volatile and it is worth more or less depending on the day, the season, the market and its condition. The same news and market conditions that affect stock market prices — unemployment, interest rates, political unrest, etc. — affect the price of your home. The difference between your house and your stock market portfolio is that you don’t have up-to-the-minute price information for your house so you don’t worry or react to its daily price fluctuation. Now I’m not advocating you turn a blind eye to your investments and sleep for the next 20 years. What I am advocating is that you think differently about the stock market. Stop thinking about the stock market as a game you win or lose. And stop viewing daily price fluctuations as wins or losses. The stock market is composed of thousands of individual companies run by millions of people incented to innovate, optimize and grow shareholder wealth. Companies that don’t do these things go away and companies that do keep going. History has shown that the wealth created by the companies that do, more than offset the ones that don’t, which is why the stock market has gone up over time. Think of investing in the stock market as part of the process to reach your retirement goal. The value of the market will change every day over the next 20-30 years. Some days it will be higher and some days it will be lower but historically returns in the stock market over the long term have been positive. The stock market has been one of the greatest creators of wealth in human history and chances are you will need to capture some of its growth if you are to reach your long-term goals. © 2014 LWI Financial Inc. All rights reserved. LWI Financial Inc. (“Loring Ward”) is an investment adviser registered with the Securities and Exchange Commission.